From simple solid-coloured kurtas to the extravagant sherwanis that you can wear at your BFF’s wedding, Zenith Ethnic Dress is your go-to for anything ethnic. Plus they do stitching as well. Located beside the McDonald’s store, this hole-in-the-wall shop is one of the many ethnic wear shops that are scattered across Commercial Street. What took our fancy was the collection and range of options available for you to kill it — be it a reception or some festival. Kurtas are available in the simplest designs — like a baby blue long kurta — to grand designs complete with beadwork, sequins, and enough bling to make you stand out. 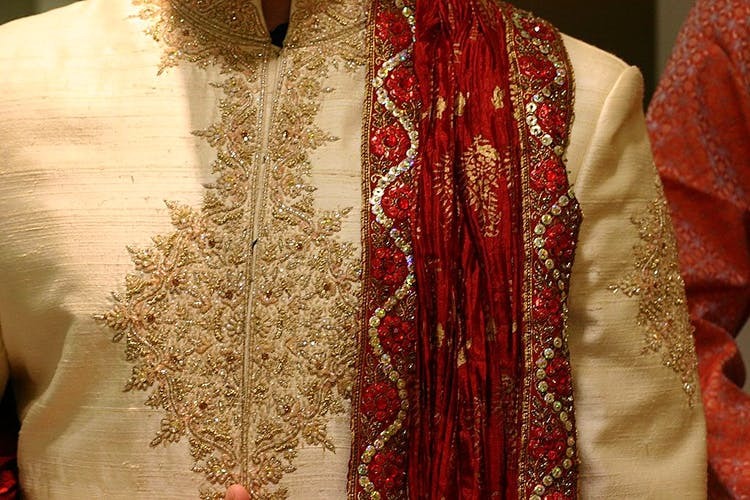 The sherwani collection is quite the collection, we think. Again, it follows the same design pattern — simple to grand — and you have options such as sherwani suits, reception and wedding sherwanis, and very Bollywood-ish designs like the one that Ranbir Kapoor wore is Ae Dil Hai Mushkil. Kurtas start at INR 650 with the bottoms starting at INR 850. Ready-made sherwanis start at INR 3,500. Well, in case you are not quite happy with the designs, don’t worry as these guys stitch too. In case you and your squad are looking for something straight out of what SRK, Bachchan Senior and Hrithik Roshan wore in the song Bole Chudiyan from K3G, expect these guys to whip it up. Charges start at INR 4,500 for regular stitching. You can bring your own fabric to the shop and have the measurements taken or ask the store to source for you.